Bathroom remodel projects are one of the more popular upgrades homeowners make to their homes next to kitchen remodels. ProSource® of Elk Grove Village offers a large selection of sinks, sink faucets, showers, vanities, tubs, toilets, and more to fulfill your customers’ project needs. We also offer professional designers to help with the process where necessary. 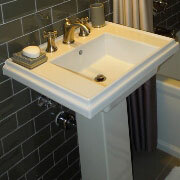 Bathroom sinks are a focal point in the bathroom. When choosing the best bathroom sink, consider your function, style, and design. In our showroom, we have a wide selection of sink options like vessel, pedestal, or shroud to meet your customer’s wants and needs. In addition to sinks, you’ll want to update or add in a bathroom sink faucet to match your sink design and style. 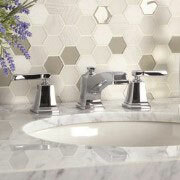 Our sink faucet selection ranges from standard to custom in modern, contemporary, or classic styles. We also offer sink hardware. The shower is a place to get clean and let your mind wander. This is why we encourage you to create a space that is comfortable and welcoming. In our Elk Grove Village showroom, we offer a myriad of shower options and combinations to meet your customers’ needs. Limited storage in a bathroom can be disheartening. Why not add a bathroom vanity? A vanity will include everything from extra storage to counter space, mirrors, and lights. 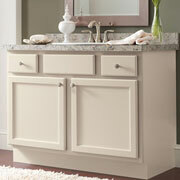 Our friendly, experts at ProSource can assist in choosing the best vanity for your bathroom. 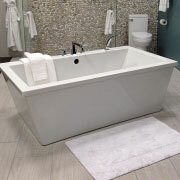 Bathtub options are numerous in our Elk Grove Village showroom. We offer tub options like standard, standing, jacuzzi, and combinations, among others, to our trade pros and their customers. Whether you want to get a quick rinse in or relax in the bubbles, we can help you find the best bathtub. The bathroom toilet is called “the throne” for a reason. It’s probably the highest trafficked item in the bathroom, too, which means choosing the best new toilet for your customer’s bathroom remodel is imperative. 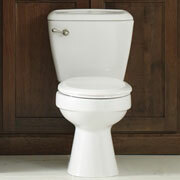 We provide you and your customers with a variety of toilet options.